AUGUSTA, Maine — Maine State Treasurer Terry Hayes filed to run for governor on Friday, becoming the first credible candidate to declare for the 2018 race and positioning herself to continue the state’s tradition of formidable non-party Blaine House challengers. The 58-year-old independent from Buckfield flew under the radar in speculation on who will run to replace the term-limited Paul LePage, but carries bipartisan gravitas as a former Democratic legislative leader who left her party to win two terms as treasurer with Republican support. But Hayes hasn’t been popularly elected above the legislative district she held for eight years. Her viability also will hinge on the strength of party nominees, who narrowly denied independent Eliot Cutler a win over LePage in 2010 and shunted Cutler to a distant finish in 2014. In an interview, Hayes said the parties have created “a conflict-centered public policy arena,” saying she’d seek to create “a collaborative one,” saying “we can’t afford to alienate people” in a small state. 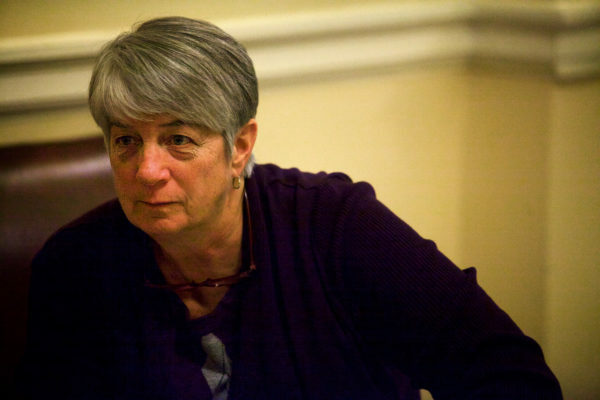 Hayes served four terms as a Democrat in the Maine House of Representatives from a moderate district in eastern Oxford County, becoming assistant minority leader in her third term and winning a fourth term in 2012 by just 42 votes. After that election, Democrats picked Mark Eves as House speaker, passing over Hayes and two other candidates. She drifted from the party, unenrolled and worked for Cutler’s 2014 campaign. Then, she got Eves back later that year. She challenged incumbent Democrat Neria Douglass for treasurer — a position elected in Maine by the Legislature — rallying minority Republicans and picking off enough Democrats to clinch a win. Last year, she did the same to beat former Rep. Adam Goode, D-Bangor. Maine’s independent streak has been famed since James B. Longley’s win in 1974 made him the first non-party U.S. governor in 50 years. Independent Angus King won two terms as governor in 1994 and 1998 and was elected easily to the U.S. Senate in 2012. Hayes, who will run as a taxpayer-funded Clean Election candidate, would be Maine’s first female governor and the first former treasurer to rise to the office since Edwin C. Burleigh in 1889. Burleigh was also the last former Maine treasurer elected to Congress until U.S. Rep. Bruce Poliquin, a Republican, won Maine’s 2nd District in 2014. Poliquin, a self-described “activist treasurer,” always looked like he was gunning for higher office during his term. Hayes has been quieter, focusing on bringing more transparency to bond sales and promoting civil discourse in politics. She could be buoyed if Maine’s ranked-choice voting system is in effect by 2018, but the constitutionality of that voter-approved law is awaiting an advisory opinion from the state’s high court. No matter the method of voting, Hayes will face stiff competition. U.S. Sen. Susan Collins headlines a formidable list of Republicans considering a 2018 run, alongside former Maine Republican Party Chairman Rick Bennett of Oxford, Senate Majority Leader Garrett Mason of Lisbon Falls, Health and Human Services Commissioner Mary Mayhew of South China and lobbyist Josh Tardy of Newport. Potential Democratic candidates include Attorney General Janet Mills of Farmington, attorney Adam Cote of Sanford, Lee Auto Malls Chairman Adam Lee of Cumberland, former Maine Senate President Justin Alfond of Portland and Eves of North Berwick. Other candidates who have filed with the ethics commission are Patrick Eisenhart, a Democrat from Augusta, and Deril Stubenrod, a Republican from Clinton. Neither is considered a viable contender.